Temple officials. They are first heard of as returning from Babylon to Palestine, after the Exile, in two batches, one numbering 392, the second 220 (Ezra ii. 58, viii. 20). A list of the families composing the first batch is given twice—in Ezra ii. and Neh. vii. ; the second batch came from a place in Persia called Casiphia and were persuaded to come by their "brother" Iddo. They were placed "in Ophel, . . . over against the water gate toward the cast, and the tower that lieth out" (Neh. iii. 26), and mention is made of "the house of Nethinim" (Neh. iii. 31, R. V.). They served under the Levites in the Temple, and were accordingly freed from all tolls (Ezra vii. 24). It is said that they had been appointed by David and the princes to serve the Levites. In Talmudic times the Nethinim were put on a level with bastards, and their descendants, male and female, were interdicted from marriage with Israelites for all time (Yeb. ii. 4, viii. 3); this is said to have been established by David (Yeb. 78b) or by Ezra (Num. R. viii.). Nethinim were allowed to marry only proselytes, freedmen, bastards, and foundlings (Ḳid. viii. 3). In tables of precedence they are reckoned very low, coming after bastards in Yer. Hor. iii. 5 and Yer. Yeb., viii. 5. This union of sacred service and social ostracism has led to the suggestion that the Nethinim were the descendants of the Ḳedeshot, or sacred prostitutes; and it may be pointed out that in the list in Ezra ii. there is a large number of feminine forms, as well as in the extra list contained in the Book of Esdras (v. 53-58). This latter list contains a reference to the "Bene Souba," with which may be compared the "Soba'im" of Ezek. xxiii. 42 (Hebr.). Both the Septuagint and Josephus refer to the Nethinim as "Hieroduli," which seems to imply that they were Ḳedeshot. Cheyne (s.v. 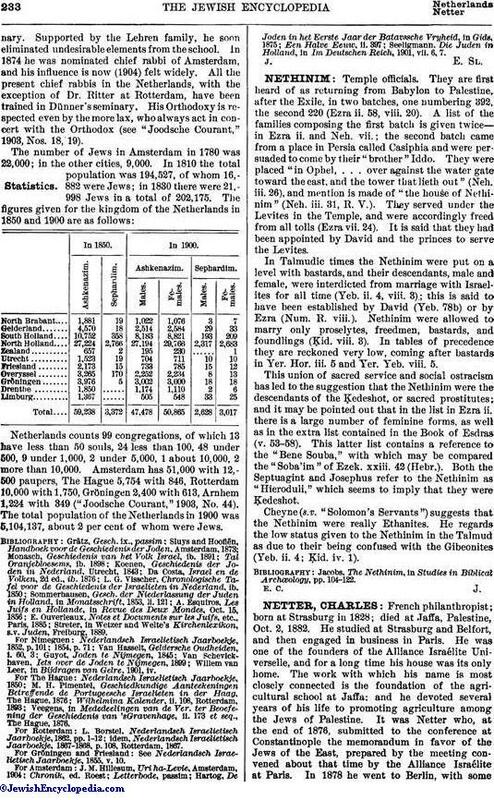 "Solomon's Servants") suggests that the Nethinim were really Ethanites. He regards the low status given to the Nethinim in the Talmud as due to their being confused with the Gibeonites (Yeb. ii. 4; Ḳid. iv. 1). Jacobs, The Nethinim, in Studies in Biblical Archœology, pp. 104-22.